Place 1/2 cup of butter and 1 cup of sugar in the bowl of a stand mixer. Beat until light and fluffy. Slowly blend in the egg, vanilla and applesauce until smooth. Add in flour, baking soda and 1 1/2 teaspoons of cinnamon. Blend until smooth. Scoop batter into your temp-tations 24-cup mini muffin pan. Bake for 20 minutes or until a toothpick inserted into the center comes out clean. Set aside to cool. Melt the remaining 1/2 cup of butter in a small bowl. Set aside. In another bowl mix together the remaining 1/2 cup of sugar and 1/2 teaspoon of cinnamon. 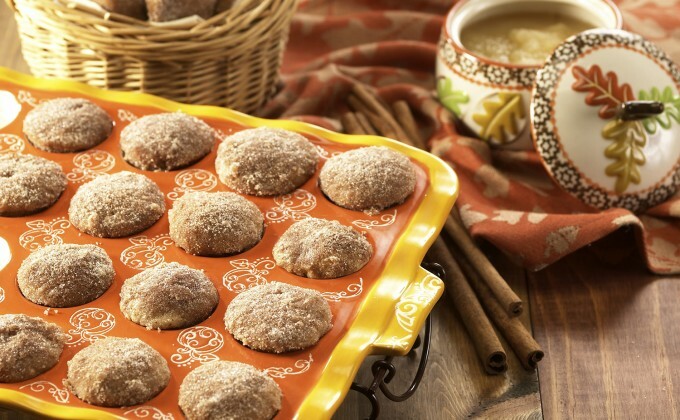 Dunk each cooled muffin in the melted butter followed by the cinnamon-sugar mixture. Arrange on a platter to serve.